The US market in public share listings is ailing; over the past two decades, the number of initial offerings has plunged 45 per cent. That is one reason Barack Obama, then president, passed the Jumpstart Our Business Startups Act, which allowed listing companies worth less than $1bn to keep their finances private for longer. The Trump administration recently loosened those standards to include any company of any size, the idea being that less onerous reporting standards would encourage more public offerings. Jay Clayton, US Securities and Exchange Commission chair, positioned it as a big win for the little guy. The extent, he said, to which companies are eschewing public markets in the US makes most individual investors unable to benefit from their growth. It is a laudable goal, not only when viewed through the lens of wealth sharing but also because companies that go public create jobs faster than those that remain private. Yet the logic of loosening standards to increase the number of companies seeking to list is wrong. It is true that the regulatory burden for public companies has risen, in part because of greater reporting demands following scandals such as Enron and the financial crisis. But by and large, companies are not eschewing public markets because of what happens during the IPO process, but because of what happens before and after. An increase in private funding sources, looser patent enforcement, added pressure for short-term results and a fraying social safety net that stymies risk-taking have reduced willingness to seek an IPO. As Steve Case, chief executive of Revolution, a Washington-based venture capital group, and founder of AOL, recently pointed out, “companies used to go public to actually raise operating capital”. Now the goal of an IPO is all too often for investors to “exit” with as high a valuation as possible. Many sources of private money, from hedge funds and private equity firms to sovereign wealth funds, are eager for a cut of a hot sector. Facebook raised $2.2bn in private equity funding over seven years ahead of its IPO. Uber has raised five times that as well as more than $3bn in debt funding thanks to low interest rates. This means that, even as the number of IPOs has decreased, the average size of companies that go public has increased dramatically. This has the effect of keeping more money in private hands: even large asset managers know they may not receive all the shares they want from a hot IPO in a constrained market, so they buy in early, acquiring a stake in the pre-public phase. A winner-takes-all dynamic is created in which a small number of institutional investors get in early on hot new companies, and fewer such companies need to come to market. Other reasons lie behind the dramatic decline in IPOs, such as weaker patent protection over the past 10 years, which makes it tougher for start-ups to protect their intellectual property and thus garner investment. 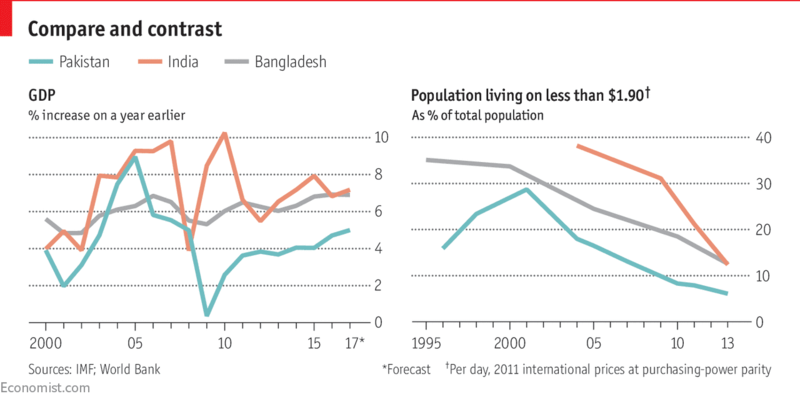 Macro issues such as decreasing public spending and a threadbare social security system play a role. The lack of single payer healthcare, for example, makes it more difficult for Americans to leave their jobs to start companies. A 2008 Harvard study estimated 11m workers were caught in “job lock” because they were dependent on employer-based healthcare. An increase in student debt, thanks in part to lower state funding of college costs, has held back would-be entrepreneurs. “With that [$1.4tn] student debt burden on their shoulders, many millennials don’t feel empowered to take the risk of striking out on their own,” says David Jolley, Americas growth markets leader at EY, the accounting firm. What is to be done? In lieu of a debt jubilee or healthcare reform, pushing back against short-term market pressure is a good start. Making share buybacks illegal, for example, as they were before 1982, would be a step in the right direction, as would limiting the amount of performance pay that can be awarded in stock options. These give business leaders major incentives to think more about the short rather than long term. Chief executives and investors such as Jamie Dimon, Larry Fink and Warren Buffett have spoken out about the need to shift standards of corporate governance so that boards can focus less on “tick the box” legal demands and more on management, strategy and risk evaluation. That would probably require major tort reform. One of the reasons boards spend so much time on such issues is the amount of corporate litigation in the US. There is lower hanging fruit, namely focusing on the types of businesses in the US that need funding. Most of them are not those that would list but those that are making ends meet via founders’ personal credit cards and loans from community banks, which have been unfairly constrained by Dodd-Frank rules. Community banks represent 13 per cent of banking industry assets but 43 per cent of all small business funding. If the Trump administration wants to repeal regulation, it would do better to focus efforts, not around making public markets more opaque, but on helping bolster the institutions that encourage start-ups to market in the first place. EVERY AFTERNOON AT sunset, at a point midway along the arrow-straight road between Amritsar and Lahore, rival squads of splendidly uniformed soldiers strut and stomp a 17th-century British military drill known as Beating Retreat (pictured). Barked commands, fierce glares and preposterously high kicks all signal violent intent. But then, lovingly and in unison, the enemies lower their national flags. Opposing guardsmen curtly shake hands, and the border gates roll shut for the night. 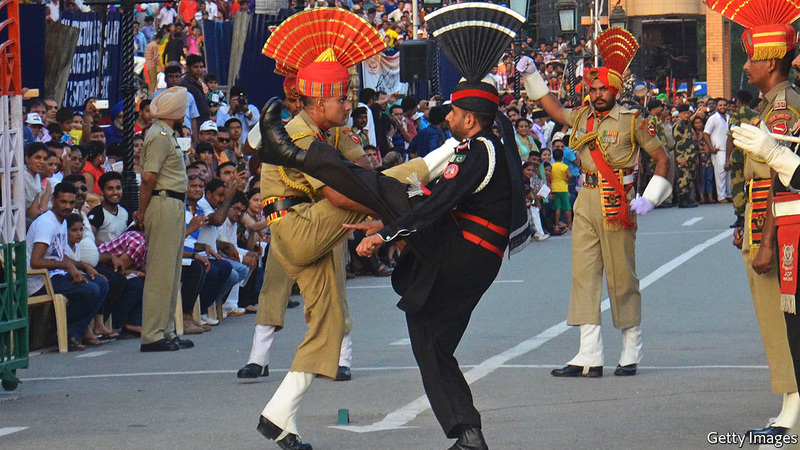 As India and Pakistan celebrate their twin 70th birthday this August, the frontier post of Wagah reflects the profound dysfunction in their relations. On its side Pakistan has built a multi-tiered amphitheatre for the boisterous crowds that come to watch the show. The Indians, no less rowdy, have gone one better with a half-stadium for 15,000. But the number of travellers who actually cross the border here rarely exceeds a few hundred a week. Wagah’s silly hats and walks serve a serious function. The cuckoo-clock regularity of the show; the choreographed complicity between the two sides; and the fact that the soldiers and crowds look, act and talk very much the same—all this has the reassuring feel of a sporting rivalry between teams. No matter how bad things get between us, the ritual seems to say, we know it is just a game. Alas, the game between India and Pakistan has often turned serious. After the exhaustion of the second world war Britain was faced with two claimants to its restless Indian empire, a huge masala of ethnic, linguistic and religious groups (half of which was administered directly and half as “princely states” under 565 hereditary rulers subject to the British crown). Just about everyone wanted independence. But whereas the Congress Party of Mahatma Gandhi envisioned a unified federal state, the Muslim League of Muhammad Ali Jinnah argued that the subcontinent’s 30% Muslim minority constituted a separate nation that risked oppression under a Hindu majority. Communal riots prompted Britain’s last viceroy, Lord Mountbatten, to make a hasty decision. He split the country in two—or rather three, since the new state of Pakistan came in two parts, divided by the 2,000km (1,240-mile) expanse of the new state of India. When the two new states were proclaimed in mid-August 1947, it was hoped the partition would be orderly. Lines had been drawn on maps, and detailed lists of personnel and assets, down to the instruments in army bands, had been assigned to each side. But the plans immediately went awry in a vast, messy and violent exchange of populations that left at least 1m dead and 15m uprooted from their homes. Within months a more formal war had erupted. It ended by tearing the former princely state of Kashmir in two, making its 750km-long portion of the border a perpetual subject of dispute. Twice more, in 1965 and 1971, India and Pakistan fought full-blown if mercifully brief wars. The second of those, with India supporting a guerrilla insurgency in the Bengali-speaking extremity of East Pakistan, gave rise to yet another proud new country, Bangladesh; but not before at least half a million civilians had died as West Pakistan brutally tried to put down the revolt. Even periods of relative peace have not been especially peaceful. In the 1990s Pakistan backed a guerrilla insurgency in Indian Kashmir in which at least 40,000 people lost their lives. In 1999 Pakistani troops captured some mountain peaks in the Kargil region, which India clawed back in high-altitude battles. A ceasefire in Kashmir that has held since 2003 has not stopped Pakistan-sponsored groups from striking repeatedly inside India. Pakistan claims that India, too, has covertly sponsored subversive groups. Analysts discern a pattern in this mutual harassment: whenever politicians on both sides inch towards peace, something nasty seems to happen. Typically, these cycles start with an attack on Indian soldiers in Kashmir by infiltrators from Pakistan, triggering Indian artillery strikes, which prod the Pakistanis to respond in kind. After a few weeks things will calm down. Just such a cycle started in late 2015, prompted, perhaps, by a surprise visit to the home of the Pakistani prime minister, Nawaz Sharif, by his Indian counterpart, Narendra Modi. Hopes raised by this overture dimmed within days when jihadist infiltrators attacked an Indian airbase. Another suicide squad struck an Indian army camp near the border, killing 19 soldiers. Faced with public outrage, Mr Modi ordered a far harder response than usual, sending commando teams into Pakistan. In the past, India had kept quiet even when it hit back, leaving room for Pakistan to climb down. This time Mr Modi’s government moved to isolate Pakistan diplomatically, rebuffed behind-the-scenes efforts to calm tensions and sent unprovoked blasts of fire across the Kashmir border. Yet Mr Modi’s pugnacity raises the risk of a dangerous escalation. “After a routine operation, the adversary may or may not escalate; after a publicised operation he will have only one option: to escalate,” writes Pratap Bhanu Mehta, one of India’s more thoughtful intellectuals. Whether India and Pakistan are reckless enough to come to serious blows would not matter so much if they simply fielded conventional armies. But they are equipped with more than 100 nuclear warheads apiece, along with the missiles to deliver them. Since both countries revealed their nuclear hands in the 1990s, optimists who thought that a “balance of terror” would encourage them to be more moderate have been proved only partially right. Indians complain of being blackmailed: Pakistan knows that the risk of nuclear escalation stops its neighbours from responding more robustly to its provocations. Worryingly, Pakistan also rejects the nuclear doctrine of no first use. Instead, it has moved to deploy less powerful nuclear warheads as battlefield weapons, despite the risk that fallout from their use might harm its own civilians. 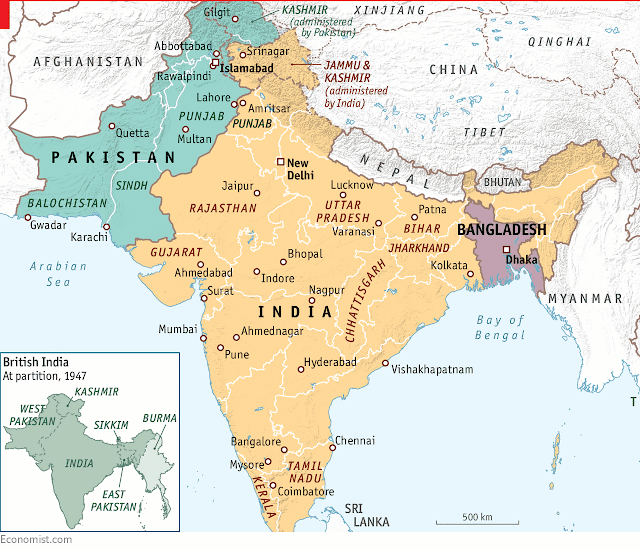 India does espouse a no-first-use nuclear doctrine, but its military planning is said to include a scenario of a massive conventional blitzkrieg aimed at seizing chunks of enemy territory and crushing Pakistan’s offensive capacity before it can respond. India’s arsenal includes the hypersonic Brahmos III, the world’s fastest cruise missile, which can precisely deliver a 300kg payload to any target in Pakistan. An air-launched version could reach Islamabad in two minutes, and Lahore in less than one. And in a grim calculation, India, with four times Pakistan’s territory, sees itself as better able to absorb a nuclear strike. Alarmists will probably be proved wrong. Both countries are prone to sabre-rattling theatrics, but they are well aware that the price of full-blown war would be appalling. And despite the uncertainties generated by the rise of China, the continuing troubles in Afghanistan and the incalculability of Donald Trump’s America, the international community still seems likely to be able to pull Pakistan and India apart if need be. As this special report will argue, though, both Pakistan and India should more openly acknowledge the costs, to themselves and to the wider region, of their seven decades of bitter separation. These include not only what they have had to spend, in lives and treasure, on waging war and maintaining military readiness over generations, but the immense opportunity cost of forgoing fruitful exchanges between parts of the same subcontinental space that in the past have always been open to each other. Trade between the two rivals adds up to barely $2.5bn a year. Perpetual enmity has also distorted internal politics, especially in Pakistan, where overweening generals have repeatedly sabotaged democracy in the name of national security. Pakistan has suffered culturally, too; barred from its natural subcontinental hinterland, it has opened instead to the Arab world, and to the influence of less syncretic and tolerant forms of Islam. For India, enmity with Pakistan has fostered a tilt away from secular values towards a more strident identity politics. Reflexive fear of India prompts Pakistan’s generals to meddle in Afghanistan, which they see as a strategic backyard where no foreign power can be allowed to linger. In turn, India, because of the constant aggravation from Pakistan, has become bad-tempered with its smaller neighbours. Small wonder that intra-regional trade makes up barely 5% of the subcontinent’s overall trade, compared with more than a quarter in South-East Asia. And it is no surprise that Pakistan has opened its arms to China, which is offering finance, trade and superpower patronage. This special report will seek to unravel the causes of this irrational enmity, and to explore the contrasting internal dynamics in both countries that sustain it. It will examine new factors in this complex geopolitical board game, such as the rise of China. And it will consider what might be done to nudge the two rivals away from the vicious circle that binds them. 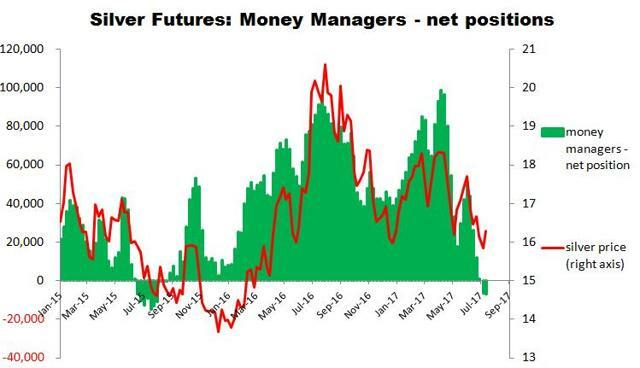 - Big speculators in gold and silver futures are extremely pessimistic about precious metals prices. - Interestingly, the US dollar delivers a similar pattern. 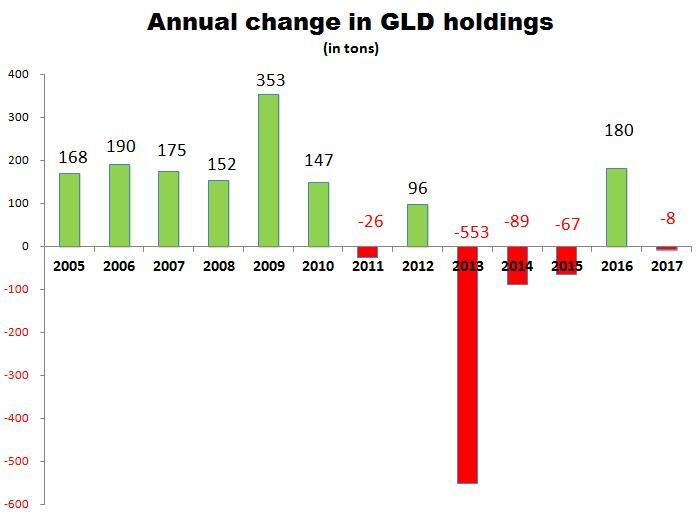 - Year to date GLD reports an outflow of gold from its vaults; however, the data delivered by IAU and SLV is totally different (inflows of gold and silver). - In my opinion, the current bull stage in gold and silver should continue; the expected trend reversal in the US dollar is unlikely to stop it. Perceptive readers have surely spotted that this time I have also plotted the S&P 500 and VIX futures. The reason is very simple – I want to show that the precious metals market’s biggest competitor is not the weak Indian demand, decreasing sales of US gold / silver coins, etc., but the US stock market. What is more, a weak US dollar makes US equities more attractive for foreign investors. According to the Board of Governors of the FED, this year (between January and April) foreign investors increased their net position held in US equities by $45.7 billion. That is why I am not surprised to see the money flowing out of the VanEck Vectors Gold Miners ETF (GDX), the most popular precious metals miners ETF. Since the beginning of July the number of GDX shares outstanding went down by 26.2 million (a decrease of 7.1%, compared to the end of June) indicating that investors were abandoning the ship called “Precious metals mining stocks”. 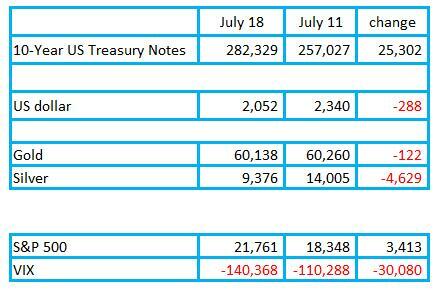 Big speculators trading in gold and silver futures are still very pessimistic about precious metals prices. For example, my gold and silver sentiment indices are close to 0%, which is indicative of excessive pessimism among big traders. In my opinion - given high pessimism and the fact that big speculators, trading in silver futures, hold net short positions - now may be a good indication of a bottoming process in the precious metals market. However, this process takes time, so short-term speculators should be cautious - because the signals I discuss above are not suitable for that group of traders. For example, big speculators trading US dollar futures have been very pessimistic about the greenback since the end of June 2017 (with the US dollar sentiment index close to 0%) but the US currency is still weakening. So my advice for short-term traders is this: wait until big speculators hold net short positions. 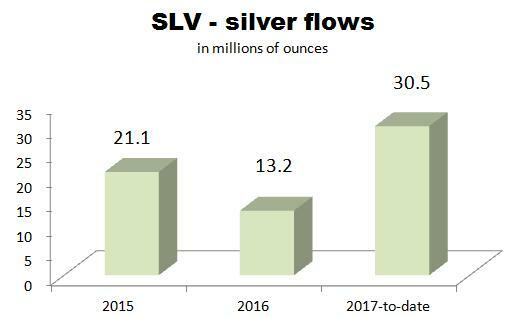 Fortunately for gold / silver bugs, another gold trust (IAU) delivers a totally different picture – year to date it reports the total inflow of 16.1 tons of gold into its vaults (516.9 thousand ounces). It looks like US equities cannot discourage investors from hoarding silver at low prices. In my opinion, the precious metals sector is in its initial medium-term bull market phase, initiated in the beginning of July. This bullish phase is supported by a weaker US dollar and a strong US Treasury market (with big speculators holding large net long positions in US Treasury notes futures). This initial phase should last until the US dollar bottoms. 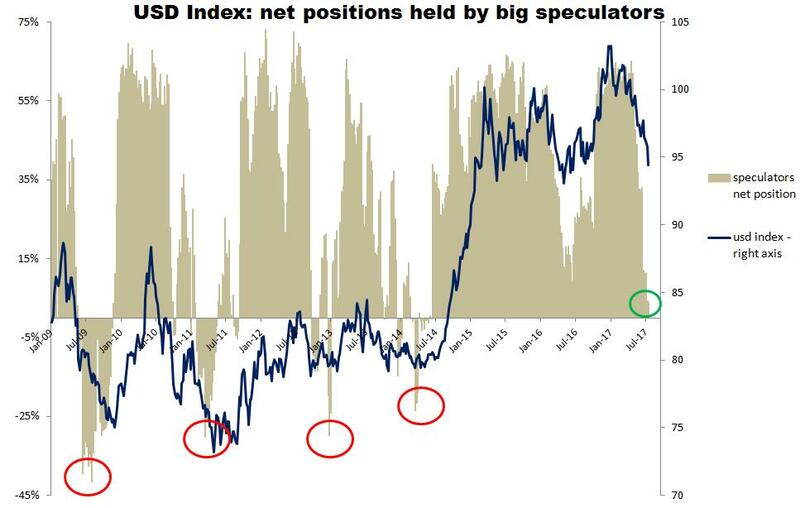 (Watch the net position held by big speculators in the greenback futures to catch the US dollar’s bottom.) However, I think that due to extreme pessimism among precious metals speculators, gold and silver prices should go up in tandem with a strengthening US dollar. I know it sounds like heresy but the precious metals market and the US dollar are in a unique configuration now. I discussed this issue in my latest article on gold and silver and this article is a continuation of that discussion. There’s a tendency to view every major political scandal in China as a litmus test for the president. So tightly is power held in his hands that whatever happens under his watch is either an indictment of his power, and thus the viability of the Communist Party of China, or a validation of it. It’s a tempting reaction, but it’s also the wrong reaction – China is, after all, a complicated and irreducible country. Recent events illustrate why this is so. Last week, Xinhua, China’s state-run news agency, reported that Sun Zhengcai, party chief of Chongqing, had been removed from office and replaced by someone loyal to Chinese President Xi Jinping. The report didn’t say that Sun was guilty of anything, but multiple sources have since told Western news outlets like the Wall Street Journal, Reuters and Bloomberg that Sun is being investigated for “serious” violations of Communist Party discipline. While the Chinese government has made no formal statement on the matter, Xi’s chief anti-corruption officer, Wang Qishan, published an op-ed in the People’s Daily the next day excoriating China’s “unhealthy” political culture, despite five years (and counting) of purges under his watch. Like clockwork, the subsequent headlines made Xi and Wang seem all-powerful. Yet it was not so long ago that headlines painted a very different picture. Before Sun’s abrupt removal, the big scandal concerned Guo Wengui, a prominent Chinese businessman who fled his home country and took to the airwaves to critique China’s government. Guo set his sights on Wang, whose position was believed to be in jeopardy ahead of the upcoming party convention. But then Sun was purged, the story was rewritten, and now Xi and Wang are again paragons of power. It’s a tired story, so let’s skip to the end: Xi is firmly in control of China. In fact, no one has been more in control of modern China since Mao Zedong. Xi continues to execute his anti-corruption campaign, but at this point it has less to do with purging potential rivals than it does with decking the halls of power with men loyal only to him. There is, by design, no opposition to Xi’s rule. He is unafraid to pursue potentially controversial policies, including economic reform, ahead of the party congress. China has a lot of problems, but revolution doesn’t seem to be one of them. What just happened in China is not nearly as interesting as where it happened: Chongqing. Chongqing is one of four Chinese cities that the central government has seen fit to classify as its own individual province. The others – Beijing, Tianjin and Shanghai – are all coastal cities, centers of Chinese wealth and power. Chongqing is an interior city, historically isolated despite its proximity to the Yangtze River and comparatively poorer than cities on the coast. Chongqing has experienced remarkable growth over the past two decades and continues to sport some of the highest regional growth rates in the entire country, but it still lags behind the coastal cities in terms of basic metrics like regional gross domestic product and disposable income levels. According to China Daily, Chongqing needs to continue to grow at current astronomic levels for another three years just to get up to China’s national income average. The story of Chongqing is the story of modern China. It’s where Chiang Kai-shek, leader of the Chinese Nationalists, eventually established his new capital after fleeing the invading Japanese army in 1938. Chiang had little choice in the matter. The Nationalists had no real power base in Chongqing or the surrounding Sichuan area, but they could not fight off the invading Japanese forces on the coast. Chongqing’s isolation and destitution made it an unappealing target for direct Japanese assault. Japan instead opted to wait out the Nationalists, assuming it could take over once the city deteriorated economically. After World War II was over and the Communists won the Chinese civil war, Chongqing was again relegated to backwater status. Years later, when China opened up its economy, successive Chinese governments invented various policies to bring the coastal profits to China’s interior. Chongqing began to blossom. Jiang Zemin called his policy “Open Up the West.” Xi calls his policy “One Belt, One Road.” Both are meant to solve one of China’s most enduring problems: massive social inequality. But the city is not without problems. Its preternatural growth rates ignore the fact that much of the city’s budget – as much as half in 2012 – comes from the central government. That same year, Xi removed from office a previous party chief of Chongqing, Bo Xilai. Ambitious and charismatic, Bo created what would come to be known as the “Chongqing model,” an economic philosophy that spurred growth through domestic consumption instead of exports – all to ameliorate social inequality. The irony, of course, is that Bo’s reforms are exactly the type of reforms China is trying to implement at a national level today. Sun is not Bo – he has neither the ambition nor the charisma that made a man like Bo so dangerous to the upper echelons of Chinese politics. But there is also no such thing as a coincidence in geopolitics. Sun is the second of the past three people to be removed from this post because of an inability or unwillingness to demonstrate his absolute loyalty to the central government. In itself this is telling. Sun’s dismissal is not a litmus test for Xi’s power. Chongqing’s status is a litmus test for the viability of the People’s Republic of China. Since it was founded in 1949, China has achieved more than what most could have imagined, but it is still afflicted by problems that cannot be solved by dismissing party officials or by writing heavy-handed op-eds in the People’s Daily. The only way to end this story is to recast Chinese geography entirely.